A 50-ton tent was raised in Petco Park on Oct. 24, 2012 in preparation for the equestrian show Cavalia. Now that baseball season is over for the Padres, Petco Park is getting ready for a big top treatment. 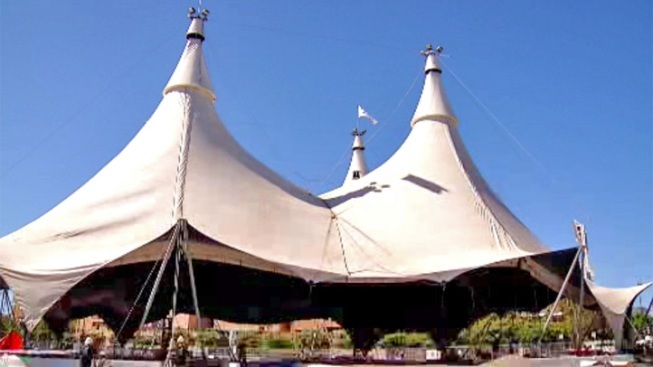 A 10-story tent was raised in the baseball arena on Wednesday in preparation for Cavalia, an equestrian and performing arts show that begins next month. Cavalia’s production will have 50 horses and 42 performers from around the world – including acrobats, dancers and musicians. The 50-ton tent is so large that it required seven trailers to haul more than 70,000 square feet of canvas to downtown San Diego. Cavalia begins playing Nov. 13 and runs through Nov. 25, but may extend depending on ticket demand.